As dentures have been around for decades, people often consider them as the only option for full jaw replacement. However since they are generally removable, dentures don’t have a solid hold on the jaw – creating gum recession and eventually leading to severe jawbone reduction. 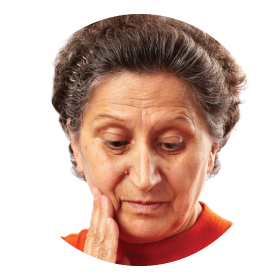 Another common link with patients who have dentures is a lack of confidence when speaking, eating and even taking their dentures out before going to bed. With waning jaw density becoming a common concern, our range of implant treatments can help you regain confidence and oral health. The All on four dental procedure is the most common means for replacing dentures as they often don’t require jaw bone augmentation for placement. The treatment follows a design using four separate implants placed in the jaw. Dr. Mark Taylor will place two implants toward the front of your mouth and two towards the back. The All on 4 treatment tightly secures a natural-looking set of imitation teeth in place – getting rid of any awkward speech impediments, eating problems and avoiding further jaw damage. Dental implants replace the feel form and function of your natural teeth better than any other restorative treatment to date, and can be used to stabilise your existing denture restoration.